Bring a saucepan of water to the boil, add eggs and cook 6-8 minutes for a medium to hard boil. Remove from water and set aside. Heat a large frypan on medium heat, add coconut oil, mustard seeds, turmeric, coriander, garam masala and ground chilli and cook 1-2 minutes, or until spices are fragrant. Add onion, garlic, ginger and cook 4-5 minutes or until translucent. Add ½ cup (125ml) water, tomatoes and coconut milk, cover and simmer for 10 minutes. Add beans and capsicum for another 8-10 minutes. Whilst cooking, peel the eggs and slice in half. 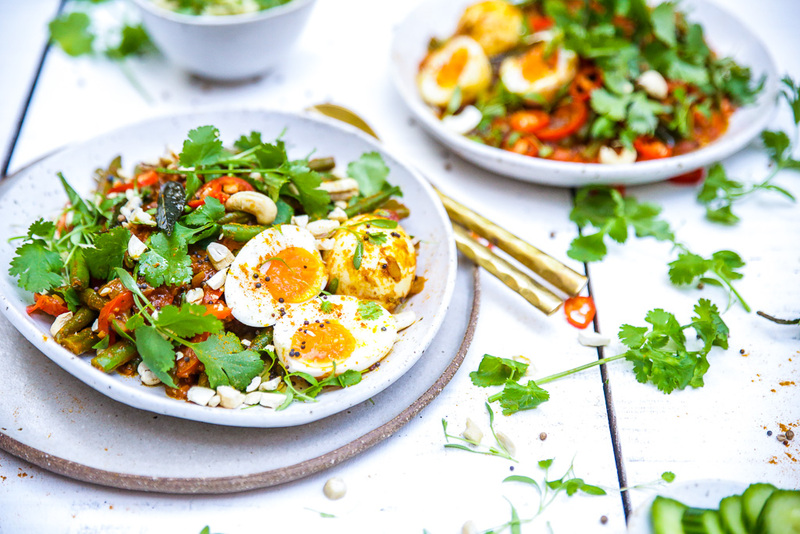 Once curry is cooked, toss eggs through the curry, garnish with coriander and toasted cashews and serve.